The National Weather Service has issued a Blizzard Watch for parts of the state Thursday. This shows the conditions during the snowstorm Tuesday in Waterloo..
Iowa’s rollercoaster winter promises another wild ride this week. Monday’s snowstorm was followed by a warm-up that’s bringing much of the state sunshine and highs in the 40s and 50s today, but another about-face is coming soon. Meteorologist Rod Donavon, at the National Weather Service, says there’s the potential for a blizzard on Thursday. While the current warm spell is melting a lot of snow, Donavon says we’ll soon be needing snowblowers and shovels again. A Blizzard Watch is in effect for 35 counties in central, northern and northeastern Iowa from 6 A.M. on Thursday to 6 A.M. on Friday. Cities included in the Blizzard Watch area include: Des Moines, Ames, Marshalltown, Waterloo, Fort Dodge and Mason City. 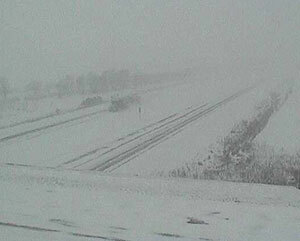 Wind gusts may be approaching 40 miles an hour, blowing snow and reducing visibility on roads. Skies should clear by Friday with forecast highs across much of Iowa in the 30s. Another chance of snow is expected for the weekend.